Úvodní stránka ENG Cubicle workspace is not for creativity. Monolithic insanity—these are the words of an inventor of cubicle system, Robert Propst (Schlosser, 2006). By this remark, at the end of his life, he commented on the outcome of a revolition he started in 1968 with his „Action Office“ system. Little did he know, how economic thinking of big corporations would twist his visionary idea. From the idea that should have embraced productivity and communication—essential to us, graphics and photographers—the cubicle system turned into an environment that creates a mere illusion of productivity. Cubicles try to accomodate as many people as possible in a small space, create high stress environment, increase communication tensions between the coworkers and bring a cold front to a communication climate at the office. 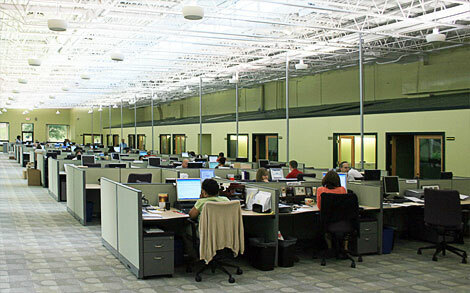 The aim of „bright satanic offices“ (Thompson P., Warhurst C., 1998) was to „create a more dynamic and flexible workspace“ (Propst R., 1986), which would promote productivity and cooperation. The workers in such an office should have had a clear view of work-to-do, of work-done, the organisation of the workspace was to ease the search for the materials. Also, absence of floor-to-ceiling walls, should have improved relationship with other workers and productivity, which in turn should have improved communicaion climate and working conditions of the employees. At first, „the concept, a set of freestanding units intended to act as room dividers in large, open office spaces, didn’t catch on“ (Schlosser, 2006). 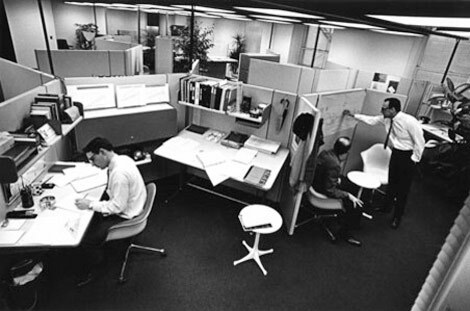 But later, corporations saw the cubicle system as an efficient way of putting maximum number of employees into an open-space environment. Also, it is easy to supervise people in an office of such a design. The idea was that employees themselves would appreciate the ease of communicating with each other and it would instill a good and healthy communication climate. But as some say, „collaboration is great, but sometimes I’d kill for a door“ (Tischler, 2005). The level of distraction can sometimes be unbearable and creates tensions in communication. There is no wonder there are a lot of books on the topic of managing interpersonal relationsips and maintaining a healthy working environment. The number of publications on this topic shows that the problem is really there and that it is not a small one. As Jared Sandberg pointed out in his article „Office managers have long justified their use by pointing to the collaborative benefits of barrier-free offices. But bosses „confuse open communication with open physical environments,“ says Sue Weidemann, director of research for Bosti Associates, a workplace analysis firm. In fact, she says, „enclosed offices are much better than any version of open offices in terms of how well communication is supported.““ (Sandberg, 2004). Furthermore, as Sandberg analyses BOSTI study of a year 2001, he states that „only 58% of people without any kind of partition said communication was well supported. Even fewer, 56%, believed that their half walls encouraged communication. But 98%, or nearly all, of those with private offices said communication was well supported.“ and he concludes that study confirmed the idea that „open offices inhibit communication.“ (Sandberg, 2004). Cubicle workspace creates many occasions to sparkle tensions between co-workers and to freeze the communication climate. Not respecting others‘ spaces: „Amanda Jacobson, who works for a financial-information company, argues that „the partitions don’t do very much but hold in everyone’s stuff“—and „they don’t do that very well.“ She had a cube mate whose stuff was always threatening to ooze into her territory. „I did my best to push it back every night after he left,“ she says.“ (Sandberg, 2004). Less calm and patient people would have escalated the conflict after several instances, and would have threatened the relationship with their neighbor and co-worker. This could in turn degrade work efficiency, and if the work is dependant on cooperation of the two, the degradation of the efficiency would be catastrophic. Another often-occuring situation is an arrogant co-worker that somehow is annoying his neighbors. Either by frequent private phonecalls, or by his choice of music that he plays through the speakers, or by some annoying habit that is not appealing to the people nearby. Mr. Sandberg introduces even more examples: „At the cube-packed call center where manager Nick Pujic works, the short partition walls have probably helped keep some inappropriate activities in check. But they didn’t stop people from building four- foot replicas of the Eiffel Tower during their down time or bringing in plants that produced allergic reactions in neighbors.“ or that the „Employees were constantly begging to be moved from the loud/smelly person just over the border.“ One way to fight it is also highlighted in the article: „“Finally, last year, the company decided to change employee seating on a daily basis. Now, with less expectation of privacy, there are far fewer problems, Mr. Pujic says.“ (Sandberg, 2004). There are some recommendations on how to minimise the risks of alienating colleagues around and how to keep healthier communication climate. James Monahan in his article about cubicle etiquette shares some of them. „…speak softly when you’re on the phone. Remember that there are other people who need utmost focus and concentration on their responsibilities. Don’t do anything that will distract your colleagues or soundproof your cubicle as necessary. Also, do not put your phone on speaker mode. It’s unnecessary and rude. (…) Don’t interrupt people who are taking calls. (…) Pretend the cubicle has a door. You wouldn’t want people barging in on you now do you. Don’t interrupt people who are looking busy, but if they are pretending to look busy, that’s a whole other matter to discuss. (…) Lay off the excessively odorous perfumes and fragrances. Some people can be allergic. 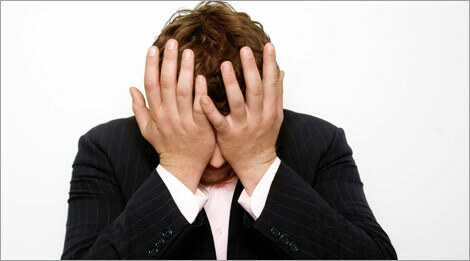 (…) Sometimes, no matter how great you think your aftershave or perfume is, it just plain stinks to others. So be considerate on this matter.“ (Monahan) As one can see, even simple things could be a source of annoyance to others and this can lead to unnecessary problems inside the working environment. Now comes the time, where the effectiveness of the working relationships and employees is more important and is worth more than the cost of running the office. (Tischler, 2005). What is needed to keep employees happy and productive—is a healthy and warm communication climate, an atmosphere of relaxation and privacy. Cubicles are simply not the best way of achieving the above stated warm climate. Sandberg Jared. (2004, September) ‚Did I Hear You Say…‘ And Other Sad Tales From Half-Wall Cubes. Wall Street Journal. (Eastern edition). New York. p. B.1 Retrieved May 10, 2007 from ProQuest database. Thompson Paul (Editor), Warhurst Christopher (Editor), (1998). Workplaces of the Future (Critical Perspectives on Work &amp; Organization). Palgrave Macmillan. Propst Robert, (1986). The Office, a Facility Based on Change. Birch; Reprint edition. Předchozí příspěvek Che Guevara iconic image by Alberto Korda. Následující příspěvek Klavs Bo Christensen’s “too much Photoshop” disqualification.